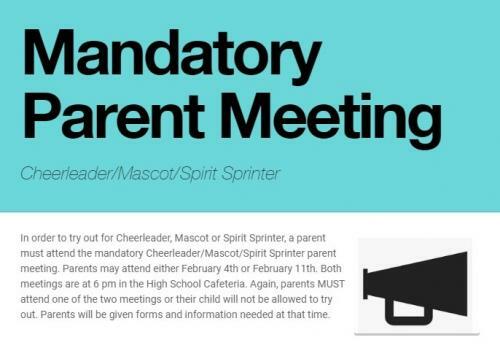 In order to try out for High School Cheerleader, Mascot or Spirit Sprinter, a parent must attend the mandatory Cheerleader/Mascot/Spirit Sprinter parent meeting. Parents may attend either February 4th or February 11th. Both meetings are at 6 pm in the High School Cafeteria. Again, parents MUST attend one of the two meetings or their child will not be allowed to try out. Parents will be given forms and information needed at that time.